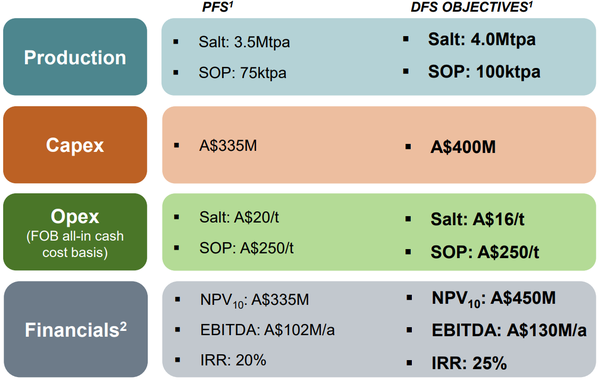 When you think of up and coming ASX mining companies, salt may not be front of mind. Yet rising demand combined with supply limitations suggest there’s significant potential on offer in this corner of the Australian resources sector. But it’s not foodies bidding up the salt price. 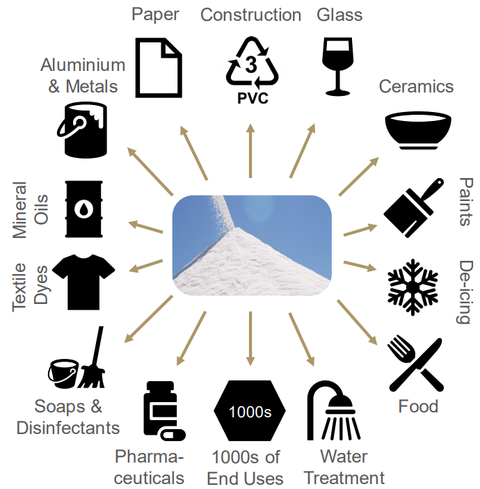 Food and feed make up just 10% of salt demand, 10% is used for de-icing, while the rest is industrial chemicals. It’s the growing Asian middle class that’s driving the market due to strong demand for the 1,000s of consumer and industrial products for which salt is required for production. On the other side of the ledger are salt supply constraints. Urbanisation has led to pressure on existing Chinese salt fields and there are limited new salt development projects globally, due to long leads times to production and increasing environmental hurdles. Fortunately, Australia offers ideal climatic conditions for solar evaporation salt production and is ideally located close to Asian markets. The key production region is the Pilbara/Mid-West coastline — a proven salt producing region, with some of the five existing operations — Onslow, Shark Bay, Lake Macleod, Port Hedland and Dampier Salt — having operated for up to five decades and with ~14Mtpa of capacity. 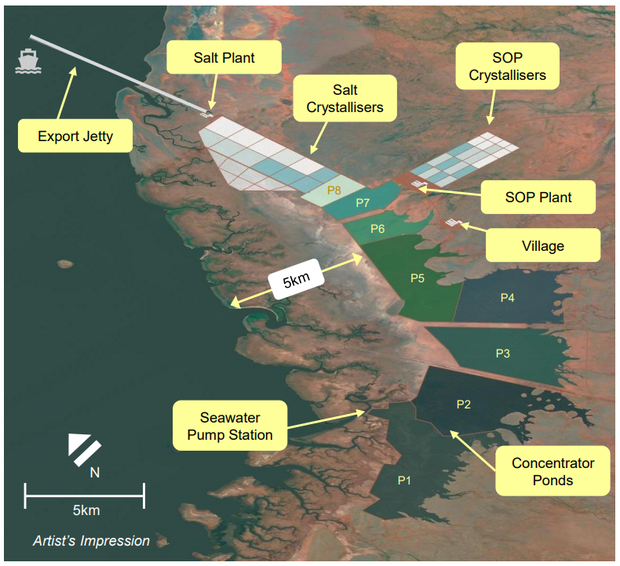 Key players are Dampier Salt (Rio Tinto, Marubeni and Sojitz) and Shark Bay Salt (Mitsui), while other smaller producers located in other parts of Western Australia (< 1Mtpa in total) include Cheetham Salt, Tellus and WA Salt. The salt project of the company I have for you today is located in the centre of this region. 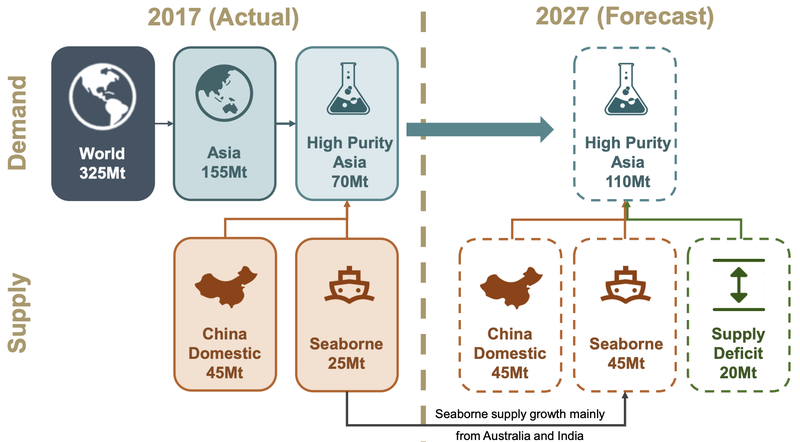 The company, backed by Kerry Stokes and with a track record of funding, developing and operating mining projects, plans to develop a project to produce 4.0Mtpa of high purity industrial grade salt from seawater via solar evaporation. And the project has something that other regional producers (including the Rio JV) don’t have — a Potash by-product. By processing of the remaining brine, the project will also aim to produce 100ktpa of Sulphate of Potash (SOP). The major barrier to entry for large scale salt evaporation projects are having a large flat landholding on the coast in an area with low rainfall and high heat/wind conditions, and with favourable impermeable clay-type soil. And given that the operations are normally spread across 20-30km, they also need to be in an area with minimal environmental and social impact. Via extensive environmental and geotechnical work to date, today’s company has demonstrated that its project site has all these characteristics. The other thing that makes this company stand out from other small ASX-listed companies is its financial strength, with $35 million cash in the bank and $6-10 million in iron ore royalties per annum. The numbers have attracted several analysts all who believe that the company is undervalued. Read on to find out what they have to say. With a market cap of just over $60 million, BCI has $35 million in the bank (over 50% of its market cap), plus it has no debt. It’s also earning $6-10 million per annum in royalty earnings from its Iron Valley Mine – an iron ore mine in WA’s central Pilbara region that is operated by $3 billion mining and services giant, Mineral Resources Limited. 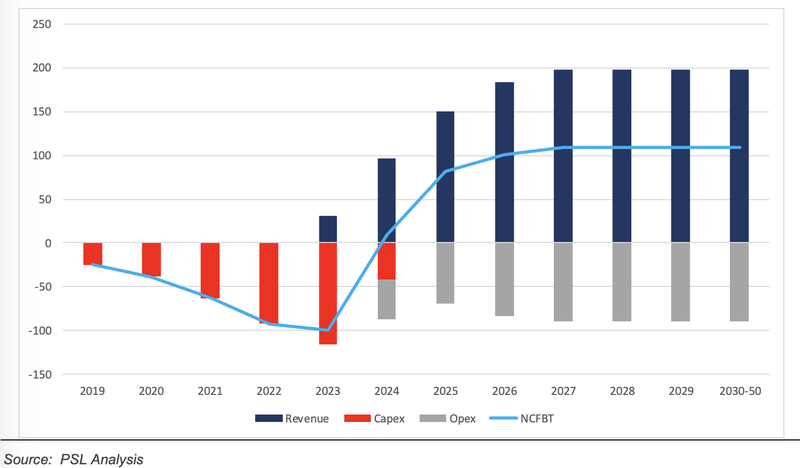 On a NPV basis those royalties — over a 12 year mine life, at current production rates — come in roughly in line with the current market cap, suggesting there’s real potential for an uplift in share price based on BCI’s cash and the royalties alone. This $35 million cash in bank and royalties will be more than enough to fund investigations into the Mardie Salt and SOP Project until it comes time to start construction. Here’s the Tier 1 long life Mardie Salt and SOP project located along the West Pilbara coast, approximately 95km North–West of Onslow, and the Iron Valley Mine in the central Pilbara. 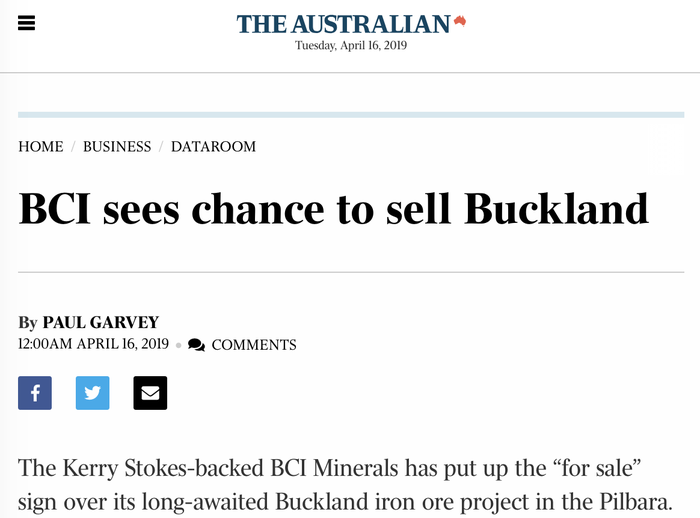 Additionally, BCI is seeking to sell its Buckland Iron Ore Project in the Pilbara as it transitions away from iron ore to focus its efforts on salt and SOP. As detailed in the following article, BCI has appointed advisors to lead the sales process for Buckland, which contains more than 280 million tonnes of iron ore grading around 57% iron. A 2014 feasibility study determined a pre-tax net present value (NPV) for Buckland of about $990 million, based around a long-term benchmark iron ore price of about $112 a tonne in Australian dollars. Iron ore dropped to a low of $52 a tonne in 2015 making that valuation look highly optimistic, but with iron ore back trading around $122 a tonne the project could find a buyer and deliver additional value to the company. We’ll look at its assets shortly, but firstly let’s examine the salt market and BCI’s position within. Salt is an essential feedstock for thousands of products. Its applications include the obvious use to preserve and flavour human food and as an essential element of animal nutrition and in the northern hemisphere, de-icing to improve road transport safety in winter. But what’s lesser known is that salt also has a host of other applications. These include in water treatment to increase purity and remove elements harmful to equipment; and in a wide range of industrial, chemical and pharmaceutical uses including glass, PVC, paper, textiles, medicines, and oils. 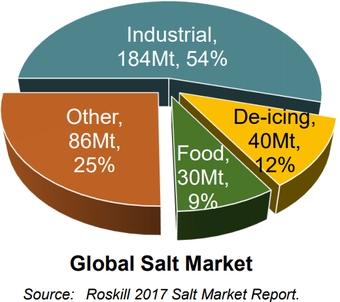 By 2027 it’s estimated that there will be a potential salt supply deficit of 20 million tonnes in the Asian market for high purity industrial salt. 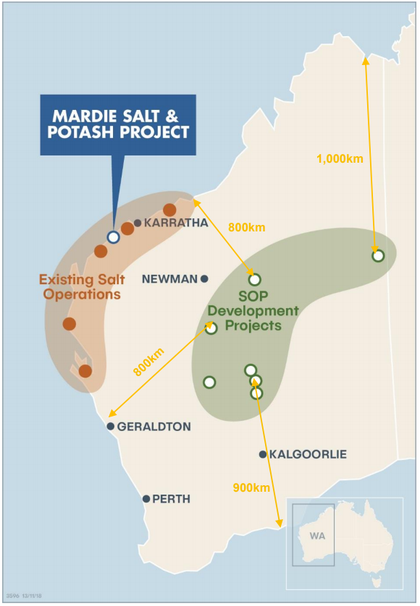 The Mardie Salt and Potash Project is a Tier 1 long life project located in the heart of Australia’s salt production region that can supply the salt and potash growth markets in Asia. Given the projected salt supply deficit, BCI is aligning its operations to capitalise on the opportunity it presents. The Mardie Project will target the growing chemical sector in Asia which requires high purity salt. Over last 10 years, high purity salt of >99.5% NaCl has sold at prices of US$40-75/t. And the high-end chlor-alkali market requires this high purity premium salt as feedstock. Chlor-alkali is the conversion of salt into the intermediate products of caustic soda and chlorine gas, which are then used to manufacture 1000s of products. 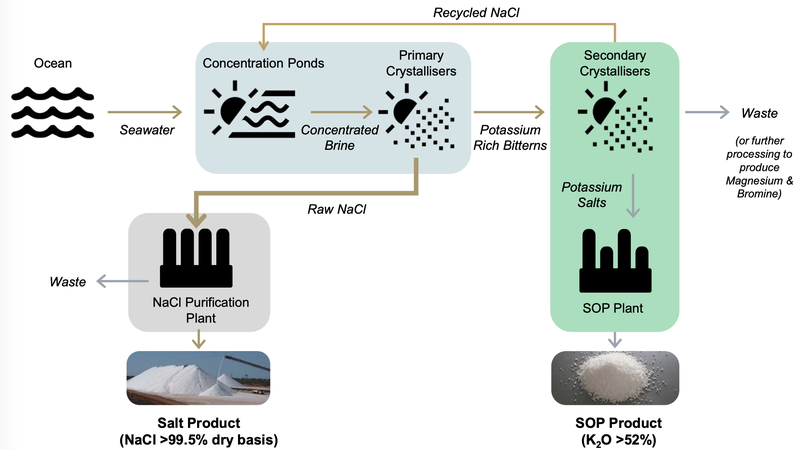 Illustrating the extensive use of these products, the world’s largest salt producer, K+S, has stated that 60% of all manufactured goods are produced using a chlorination phase. Mardie’s salt will be a high-purity product ideal for use in the Asian chemical industry and in-particular, the chlor-alkali market. Currently, most of the high purity salt exported into Asia is shipped from Australia, Mexico and India. 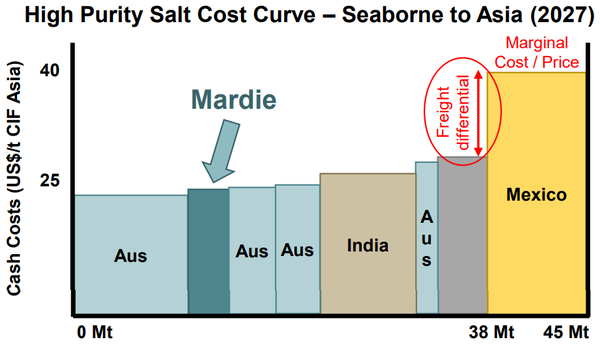 Mexican salt being shipped into Asia is setting the marginal price, however Australia has ocean freight cost advantage over Mexico of ~US$15/t, as can be seen in the chart below. This suggests that the Mardie Project will be cost competitive with existing Australian operations. Furthermore, when it comes to SOP, BCI is likely to produce at a much lower cost. This is because Mardie SOP is a by-product, with a large percentage of capital and operating expenses “sunk” against salt production — meaning they would occur regardless of whether the SOP was produced or not. The project will aim to produce 100ktpa of SOP. SOP is a premium fertiliser used on higher value crops such as fruits, berries, and vegetables, and it has a strong long-term demand outlook. This is largely due to an increasing Asian middle class needing more and better quality food, combined with a reduction in arable land increasing crop yield requirements. As the map highlights, there’s no existing SOP production in Australia, with all planned projects based on extraction of brines from inland salt lakes. Being located on the coast will keep Mardie’s SOP competitive, as inland brine SOP projects are up to 1,000km further to port than Mardie — adding around US$50/t in additional transport cost. 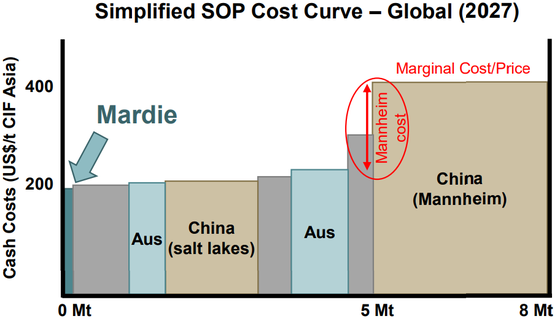 This, combined with the fact that SOP is by-product, could see Mardie become one of the lowest cost producers of SOP globally. BCI plans to rapidly develop the project, capitalising on market dynamics and creating substantial long-term value for all BCI stakeholders. Fortunately, BCI has an inexhaustible seawater resource and production utilising ~95% solar and wind energy, leading to a sustainable operation with a very long life. From this inexhaustible seawater resource, Mardie will produce salt as primary product and SOP as by-product. Approximately 75% of the project’s revenue will be generated through the salt side of the operation, while the Sulphate of Potash (SOP) will contribute the rest. Environmental, heritage and tenure is well defined. Significant environmental surveys have been completed and no material issues were identified, with environmental approvals are on track for late 2019 (EPA endorsed timeline). Land use agreements that allow for production have been secured with Native Title claim groups and heritage surveys for a majority of the project area have been successfully completed. 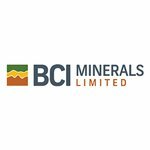 BCI has Mining Act tenure and is seeking terms competitive with other WA salt projects and has government support for an export facility at Mardie, although leases remain to be negotiated. Existing studies envisaged transporting salt from the Mardie site to the proposed Cape Preston East Port via a 67km sealed private road to be shipped to Asian markets. However, BCI with government support for an export jetty at the Mardie site, BCI won’t need to truck the salt to the Cape Preston East Port. Although this will increase capital expenses by approximately $65m, it will enable for significant reductions in operating costs, of roughly 20%, which will have a net benefit. There is a vast area of mudflats with impermeable clay soils (130km2 / 13,000ha). The site layout was designed 3-5km inland to limit disturbance of coastal ecosystem. There will be six pumps with 10,000l/s total capacity, eight large ponds and 36 crystallisers over a 20km x 5km area (100km2 / 10,000ha). Other features include the Salt Plant and SOP Plant with modern technology, the salt export jetty to reach >3m water depth, and access to transhipping to large vessels anchored offshore. Patersons Securities produced a research note on the company in March when it initiated coverage on the stock, tagging it with a ‘Speculative Buy’ recommendation, and a 12-month share price target of $0.25 — a 67% premium to the share price at the time. The broker undertook a cash flow analysis of the Mardie Project and, as you can see below, expects first revenues in 2023 and for the project to become cash flow positive in 2024. Edison has also initiated research this year and similarly to Paterson’s predicts a bright future – a potential doubling of its share price as a base case. Although, it should be noted that broker predictions remain speculative. Edison’s say that Mardie is the key to valuation upside because when it comes to mining companies developing projects, the lowest valuations are encountered at the PFS stage. Edison note that if the DFS the same conclusions as its PFS it should immediately increase Mardie’s valuation to circa 18.22 cents per share. 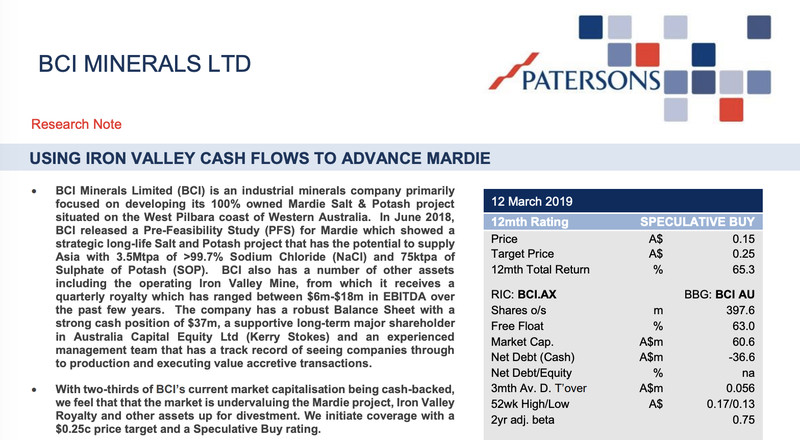 But as is, “we value BCI at 19.51 Australian cents per share, to which should be added an immediate 5.84–11.15c for the value of its Mardie salt and sulphate of potash (SOP) project and a further 2.43c for the value of its Buckland iron ore assets. With that outlook, BCI is moving forward in big ways. Iron Ore Holdings (who were acquired by BCI in 2014) gained ownership of the Mardie tenements in 2011 at minimal cost. When initially purchased it was assumed that the area would be drilled and explored for iron ore. But as drilling became restricted due to thick salt forming across a large proportion of the mudflats, BCI commenced option studies to explore the idea of a potential salt operation. In July 2017, a scoping study was prepared by BCI in conjunction with industry consultants and specialists. The results indicated the potential for a low-cost high purity industrial-grade salt operation that could produce 3.0-3.5Mpta of salt over a 30 year mine life. BCI then completed a PFS in June 2018 that built on the project scope defined in the scoping study. The PFS indicated there was potential to produce a minimum of 3.5Mtpa of salt as well as 75ktpa of SOP. A definitive feasibility study (DFS) is underway and BCI has appointed GR Engineering to serve as lead engineer. 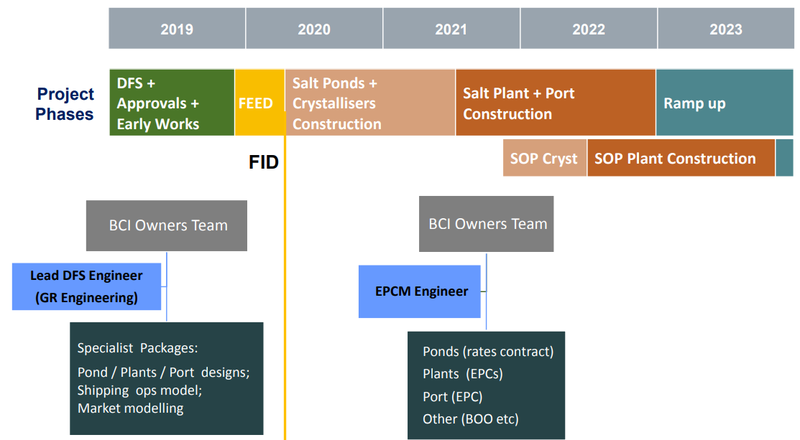 WorleyParsons and Swiss-based Salt Partners have been appointed on the design packages for the site’s salt plant, SOP plant, ponds and crystallisers. The currently underway DFS is targeting 4.0Mtpa and 100ktpa of SOP. This is expected to be completed towards the end of 2019. DFS numbers are BCI’s aspirational aims. Financials based on a 30-year operating life; pre-tax basis; salt price of US$30/t FOB; SOP price of US$500/t FOB; AUD exchange rate of 0.75; ocean freight cost of US$13/t to Asia. A geotechnical drilling and test work program at Mardie is nearing completion. 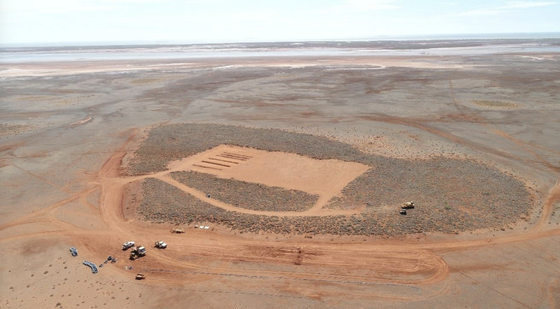 The program, comprising more than 60 wide diameter drill holes, is being undertaken to confirm optimal locations for evaporation ponds and infrastructure, including the alignment of an export jetty. Construction of a small-scale evaporation trial is underway at site, which will provide site-specific evaporation data at a range of densities and simulate the full evaporation process at a 1:40,000 scale. The trial will also produce raw NaCl salt and kainite-type mixed salts (KTMS) for salt and SOP processing test work and marketing samples. Approximately 20,000 litres of potassium-rich bitterns have been acquired from an existing salt operation to fast-track the production of KTMS and SOP test work. 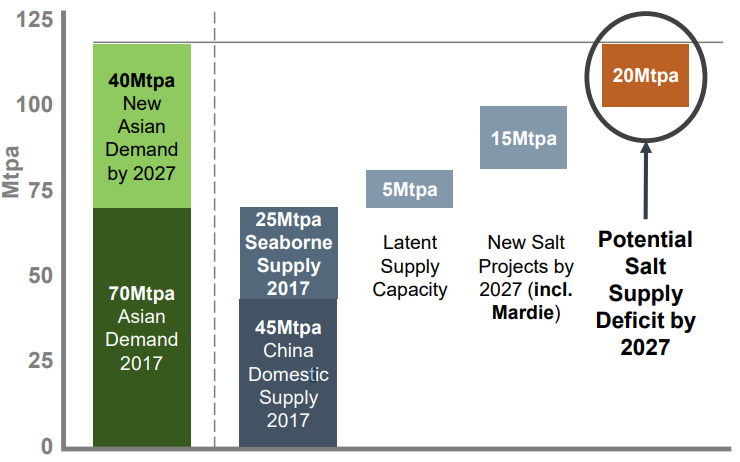 The DFS for the Mardie Salt and Potash Project is progressing on schedule for completion in the December 2019 quarter and final investment decision by the March 2020 quarter. The project has roughly a three and half year development timeline from construction of the first ponds at the start of 2020 to first production of salt in 2023. Total capital expenditure required to produce and export is estimated to be $335m, however this could potentially increase to $400m if the proposed export jetty at Mardie goes ahead at the DFS. Supply and demand fundamentals are supportive of development of Mardie, plus the company is well funded and supported to accelerate the project. 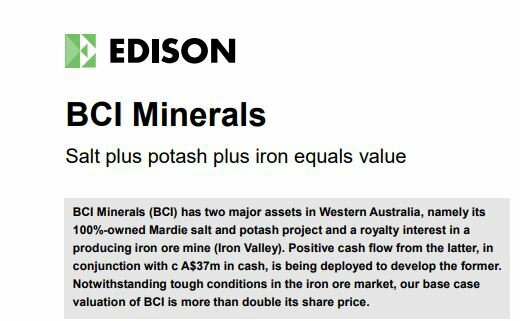 Add to that BCI’s development track record, and it appears set to establish a strong position in the salt production and export market. 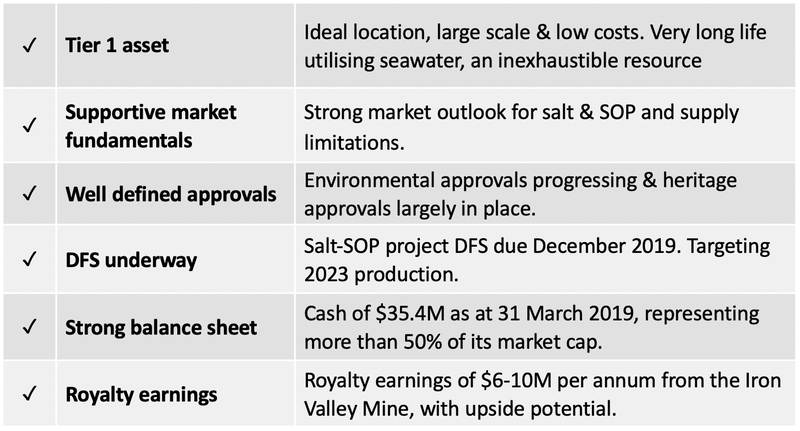 Given that it seems that market is undervaluing the company’s current financial position­ – its Iron Valley royalties, cash in the bank – plus the significant potential on offer from the Mardie Salt and Potash Project, the answer to the above question may very well be yes. There could be plenty of lift in the share price for new and longstanding shareholders alike.